Demonstrate the Value of Diversity: This requires that individuals acknowledge the various differences needed within an organization. This is further seen in the process where organizational employees and their potential are recognized and developed. Employees working toward their strengths and having a broader world view tend to be more productive. Productivity can be translated into capital gains. An example of this can be seen with MFG.com, a high-growth venture backed global internet marketplace for the manufacturing industry. During his time at MFG.com, Sherwin Krug developed a dynamic initiative to promote and invest in diversity whereby global awareness would become a direct benefit. This initiative allowed for employees willing to take their vacation outside of the United States to receive $500 towards their trip, $250 for their spouse, and an extra day of vacation. The value on diversity was so great that the company was willing to make a financial investment in their employees to gain a different, more inclusive perspective. Consider the Impact: We live in a global society where information is transmitted and becomes available in seconds. The nature of how business is conducted has rapidly changed as a result of technology. Organizational leaders, who fail to understand global needs and their implications, fail to have a progressive strategic plan. Progressive and inclusive plans consider the local, national, and global impact an organization desires to have and what is needed in terms of resources, particularly a diversity of human resources. Be Proactive: A part of being strategic is thinking 3-5 years into the future on a short-term basis, and even more time long-term. Organizations must consider changing trends and be in a position to anticipate future needs. These trends include a workforce having an increase in: (1) racial and ethnic minorities, (2) women, (3) tech driven and savvy individuals, as well as a (4) cross generation of employees (Baby Boomers, Gen Xers, and Millennials (also known as Generation Y)) each with varying needs, opinions, and world views. Be Responsive: This is in no way in opposition to the previous point, but rather, it is in conjunction. Organizations need to be responsive to their employees and the community being served (directly and indirectly). To be responsive, organizations must know the strengths and capabilities of their staff and trust their staff to do the jobs they were hired to do. Additionally, organizations must know their customers. Organizational leader should frequently try to ascertain, “Who are our customers, what are their expectations, what services should we be providing, and how do we know this information?” Effective response strategies enables a company to deliver the highest standards of employee and/or customer care at a time when it is needed. Technology now affords individuals and businesses with the ability to be responsive in minutes. We live in the age of blogs, text messaging, Skype, Facebook, Twitter, Foursquare, LinkedIn, Myspace, Email, and a host of other new media technologies that enable rapid communication among connected individuals, in addition to the telephone whether mobile or landline (as landlines still have their place and usage in our society). With all these varied potential methods of communication, it would be rather difficult for a company or its leadership not to be responsive. Be Dynamic: Static by its very definition means lacking in movement, action, or change, especially in a way viewed as undesirable or uninteresting. Static businesses are eventually viewed with having “Going Out of Business” signs in their windows. Businesses are in place to meet specific societal needs. When those needs are no longer being met; realistically, there is no need for that specific type of business. When an organization understands the value of being dynamic, they tend to be creative and innovative. 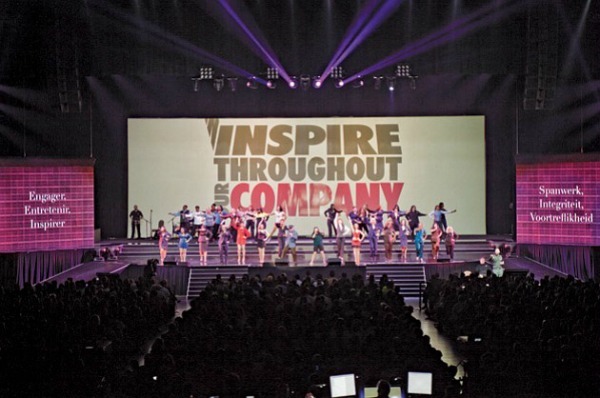 Earlier this year, Business Week published an article titled: “For Corporate Training, MGM Resorts Puts on a Show”. At first glance, the article appears simple and unassuming. However, when the nuts and bolts are analyzed, the reader learns that MGM wanted to get their message of being “the greatest company in the world” out “fast enough” and in “a way to reach everyone” in the organization. So gone was the use of PowerPoint slides and in was a show written, produced, and starring MGM employees – Inspiring Our World: A Musical Journey, which explored MGM’s commitment to diversity and sustainability. The noted highlight of the production was a series of employee testimonials about race, gender, religious, and weight-related discrimination. This was MGM’s attempt to increase attendance and get all of their 62,000 Las Vegas-based employees through its corporate diversity program. Successful businesses are mirrors of the leaders at the helm. Leaders demonstrating these skills are in reality organizations demonstrating these skills. As we move toward fostering a more equitable and inclusive society, we must be very mindful of where we are organizationally and where we are headed. Not being cognizant of these items is being irresponsible. What, if anything, do we truly lose by not valuing diversity? I would love to hear from you…What’s your opinion? Please leave your comments below*.